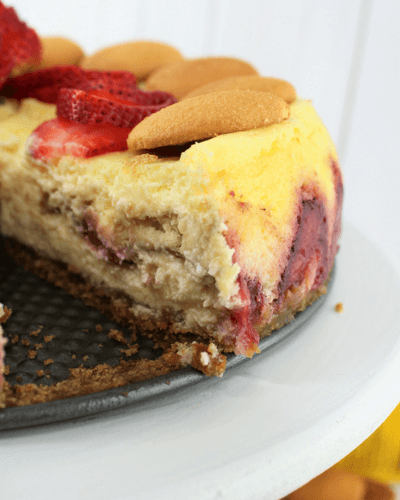 Strawberry and NILLA Wafer Layered Cheesecake with fresh strawberries, a simple and smooth cheesecake filling, a sweet NILLA Wafer crust and beautiful strawberry flowers decorated on top. NILLA Wafers always bring back childhood memories for myself. My grandmother would frequently make various cream cheese dips with NILLA Wafers on the side for family gatherings and holidays. The texture and sweetness of NILLA Wafers are so delicious. NILLA Wafers are crispy but still melt in your mouth, which kind of make them the perfect treat for young kids. My own children definitely beg for them during snack time. I love them because they are simple and make the most wonderful pie crusts! Ibotta is a great app that helps you earn money as you shop! Right now, when you buy 2 NILLA Wafer boxes or pie crusts you earn $1.00. Your spring baking just got a little sweeter. Simply click the images below and save yourself some money. Your local Walmart will have all the ingredients for your Strawberry and NILLA Wafer Layered Cheesecake. 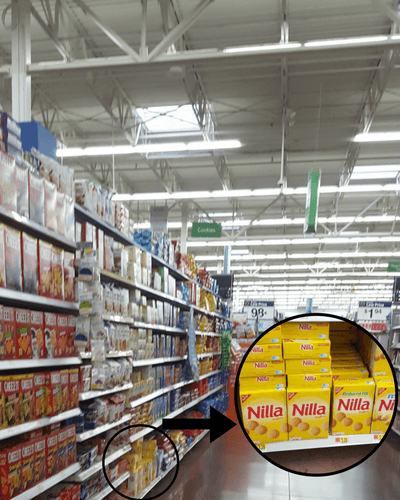 To find those delicious NILLA Wafers, check out the cracker/cookie aisle. Look for the bright yellow box. I bought the original today but the reduced fat or minis will also work well with this cheesecake. The minis would actually be fantastic so pick up whichever one you would like. Make the crust with crumbled NILLA Wafers and melted butter, press into the bottom of your spring form pan. Line fresh sliced strawberries around the edge of the pan. Pour half your cheesecake filling into pan. Make sure that your cream cheese is softened and not directly from the fridge when blending to ensure a smooth texture. Make a layer of sliced strawberries. Make a layer of NILLA Wafers. Pour the remainder of cheesecake filling on top. Easy enough, right? Bake on 325 degrees for 1 hour, 20 minutes. Once the cheesecake cools, decorate as you wish. Should you do a water bath for the cheesecake or not? This is up to you. When I know I am decorating the top of a cheesecake, I don’t worry about the water bath so much but it never hurts to do one! For a water bath while baking, place a large piece of foil on the bottom and up the sides of the spring form pan. You then will place that on top of a large pan that is filled with hot water. This can help reduce cracking of the cheesecake from steam while in the oven. 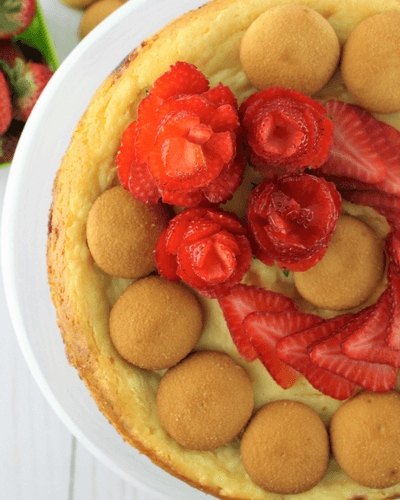 Watch the short video below to learn how easy it is to make a strawberry flower garnish on top of your beautiful Strawberry and NILLA Wafer Layered Cheesecake. Little touches like these flower strawberries can really make a dessert special and it will be a topic for discussion amongst your friends and family. 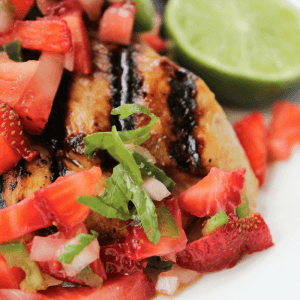 I look forward to this spring season ahead to enjoy time with friends and family and can’t wait to make this recipe again for everyone. 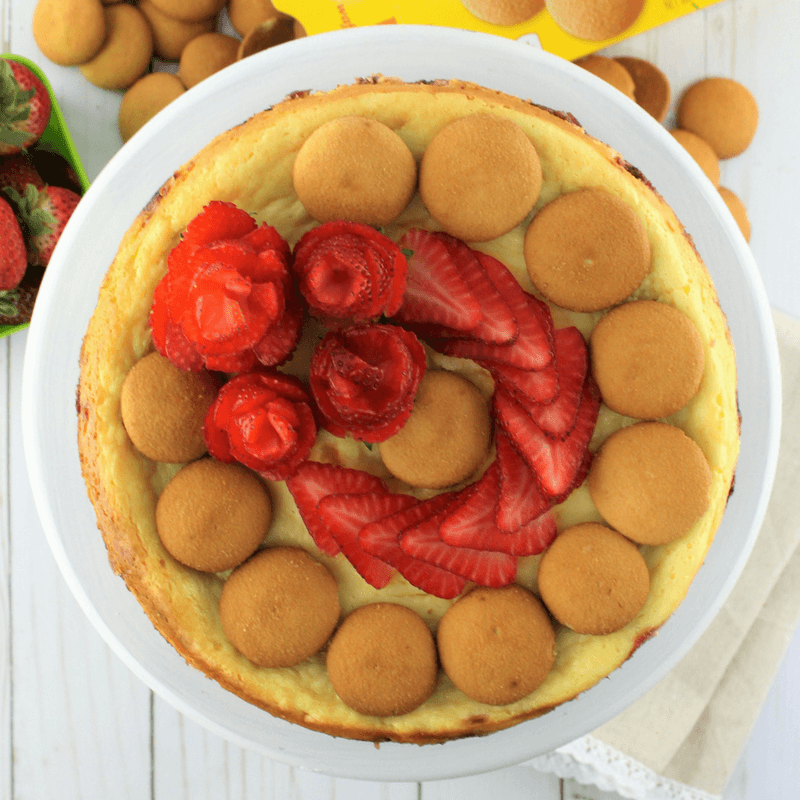 Easter and Mother’s Day are just around the corner and a delicious Strawberry and NILLA Wafer Layered Cheesecake will just be so perfect and I know everyone will be in love with the strawberry flowers. NILLA Wafers also makes a premade crust available at Walmart. If you would like to use the premade crust, follow all instructions below besides the following. You will need to separate the cheesecake filling batch into two separate pie crusts and reduce the cooking time to 35 minutes on 350 degrees since these will be smaller cheesecakes. The cheesecake filling, layering and decoration can all stay the same. The layered cheesecake will be fantastic no matter what you do! I cannot wait to see how yours turns out. Want more recipe ideas? Make sure to visit NILLA Wafers for more great ideas and see all the simple goodness you can create this spring season. Grab a 9 inch spring form pan, stand or hand mixer, measuring cups, mixing bowls, cutting board, knife, food processor, foil and water bath (optional). Put 2 cups worth of NILLA Wafers into the food processor and pulse until broken into tiny pieces. Place crumbs into a medium mixing bowl. Add the 1/3 cup melted butter with crumbs, mix and pour into the bottom of the spring form pan. Press the crumbs down slightly to even out the crust. From your quart of strawberries, grab 3 pretty strawberries that will stand up nicely for those strawberry flowers. Slice the remainder of strawberries. Line strawberry slices around the edge of the spring form pan. Save remainder of strawberries for later. Now make your cheesecake filling. Place 4 packages of cream cheese into large mixing bowl, along with 1 cup sugar. Using your stand or hand mixer, blend until smooth. Add 1 teaspoon vanilla extract, 1 teaspoon lemon juice and 4 eggs to cream cheese mixture and blend until creamy and smooth, leaving no cream cheese chunks. Pour half the cream cheese mixture into the spring form pan. Place a layer of sliced strawberries on top of cheesecake filling. 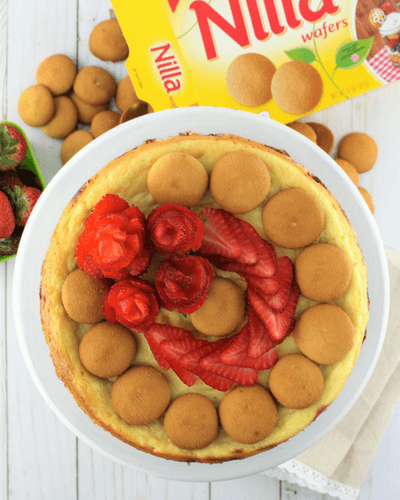 Place a layer of NILLA Wafers on top of the strawberry layer. Pour the remainder of your cheesecake on top. Cover with foil. Place cheesecake in oven in a water bath (optional). Cook for 1 hour. Remove foil cover and cook another 20 minutes. Once cooled, take a butter knife and do a sweep of the outside edges of the cheesecake/spring form pan and place in fridge for 2 hours. Remove the cheesecake from fridge and release from the spring form pan. With the 3 whole strawberries that you picked out the quart earlier, make your strawberry flowers. Finish decorating the cheesecake. You can do whatever you please on top. I did a circle of NILLA Wafers, a circle of sliced strawberries with 3 strawberry flowers. I can’t eat any of this goodness because of my food allergies but I just had to read the article anyways. I am salivating at every ingredient lol I used to make cheesecake all the time and whenever anyone orders it, I ask if I can smell it. The cake looks delicious and creative. Everyone gets what the love. Give it a try! This is one of my favorite treats to make for any occasion or just because. 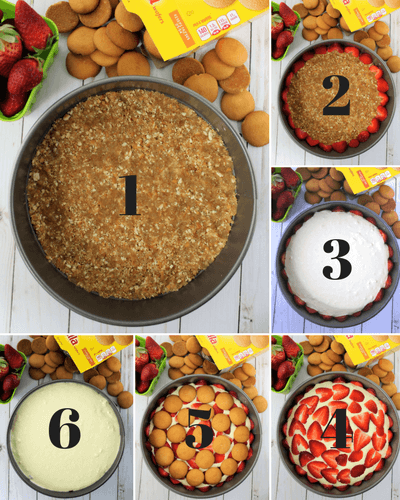 I usually make my own vanilla wafers and there are so many different fillings and toppings it is always a winner. One of my favorite treats too Candy! They are so versatile, aren’t they?